Five Russians of Chechen origin have been detained in France on suspicion of planning an attack, the local prosecutor’s office has confirmed. The Russian Foreign Ministry says it has been notified about the arrests. "Our diplomatic offices in France - the embassy in Paris and general consulate in Marseille - have requested necessary information from French authorities, in a response to which it has been confirmed that the five detained persons are Russian citizens," the ministry said in a statement on its official website, adding that further details would be provided later. One of the detained has been identified as Zelimkhan Ismailov, a resident of the French town of Beziers. He was incriminated with "participation in violators' association with the aim of planning an act of terror," according to the ministry. Earlier on Tuesday, prosecutor Yvon Calvet said five Chechens had been held overnight on Monday in Beziers, a town in southern France. The detained were not on security services lists, the prosecutor said, according to local reports. He also added the case does not have religious implications and that the arrests followed an investigation, started long before terrorist attacks in Paris earlier in January. The five were initially reported to have been planning an act of terror. However, the French official believes criminal activity seems to be more likely in this case, though nothing is being ruled out. The suspects’ ages range from 24 to 37, according to BFM TV. According to Midi Libre, the Chechens are also suspected of hiding a cache of explosives, which was found near the Sauclieres stadium in Beziers. One of the arrested lived in Beziers and another "probably" in Montpellier, said the prosecutor. 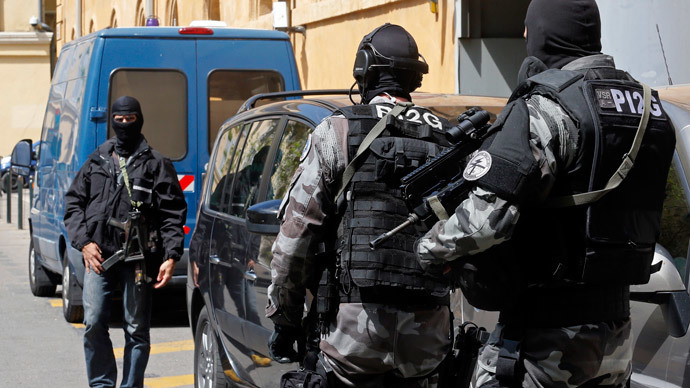 Earlier, French media reported that four Chechens and one Austrian had been detained in the Beziers and Montpellier region overnight from Monday to Tuesday. The investigation into the case is being carried out by judicial police in the Montpellier region and an anti-terrorist squad, Midi Libre reported. Searches took place at the suspects’ homes and “products were found” there, said the prosecutor without specifying its nature. One of the suspects was reportedly monitored for some time by police. According to Midi Libre, he might have been involved in an explosion that occurred at Montpellier University on November 12, 2008, which injured six, two seriously. Russia’s southern Republic of Chechnya, along with neighboring Dagestan and Ingushetia, has seen massive Islamist insurgency in the past and still faces threats of terrorism against the civilian population. In April 2009, Russia ended its decade-long counter-terrorism operation against militants in Chechnya, but sporadic attacks in the region still continue. In recent years, the epicenter of violence has shifted from Chechnya to Russia's other North Caucasian republics of Ingushetia, Dagestan and Kabardino-Balkaria. Among the most recent anti-terrorist operations in the region was one in Grozny, the capital of Chechnya, in December. Ten law enforcement officers were killed and nine militants eliminated in the operation, according to the republic’s head Ramzan Kadyrov. One of the most notorious terrorist attacks performed by assailants connected to the region was the Boston Marathon bombing on April 15, 2014, that killed three people and injured more than 200. Dzhokhar and Tamerlan Tsarnaev – the perpetrators – were ethnic Chechens living in the US. Tamerlan was reportedly on the US government’s database used to track suspected terrorists. His details were entered into the Terrorist Identities Datamart Environment (TIDE) list after the FBI spoke to him in 2011, following a request from Russian authorities to the CIA to investigate him for suspected radical Islamist activities. He was flagged on that database when he left the US for Russia in January 2012, but when he returned six months later, he had been downgraded. Tsarnaev’s inclusion in the list, as well as the tip-off from the Russian government, prompted many to criticize the US for allowing the alleged terrorist to fall through the cracks. But officials say that simply being listed in TIDE is not enough to justify special attention by law enforcement.